Pharrell’s voice graced tracks like a stratospheric cherry on top of his ice cream sweet lunar beats. East coast, west coast, tomato, tomahto: it’s all hip-hop. Leave it to alien producers to bridge the battleground. With these two space cowboys at the helm, where would Hov and Snoop meet to squash the beef? “In outerspace” – on planet Neptune. Yeah, I said it. 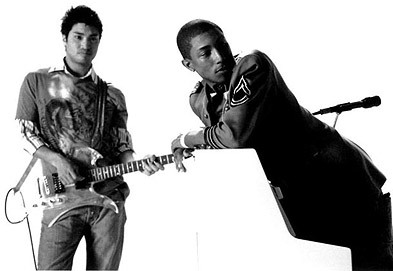 The Neptunes brilliance is highlighted by the shadows that are N.E.R.D.’s own albums. N.E.R.D. has epic singles, but albums that find themselves stagnant in the experimental place. That would work for most artists, but most artists aren’t Pharrell, Chad, and Shay. That said, this remix has The Neptunes topping an N.E.R.D. track that was already great – so if remixes were the cereal kingdom, this one would be Tony the Tiger: grrreat. Production notwithstanding, Everyone Nose (Remix) touts the lyrical kingpin trio that is CRS – Pharrell, Kanye, and Lupe – with the literal kingpin, Pusha T cutting killer lines worth more than a white brick’s weight in gold. Real talk: one thing is for sure, if The Neptunes remix a record – we’re all star trak riding it.